Objects in the mirror. She’s not an object, she’s a person, a little beggar girl. A reflection on a society. Ignored, shooed away or just plain treated as invisible when she taps on car windows with a well practiced and trained, pleading face. A smile is given not money, she gives up and her face breaks into a wide grin, appreciating a little kindness she is not used to. 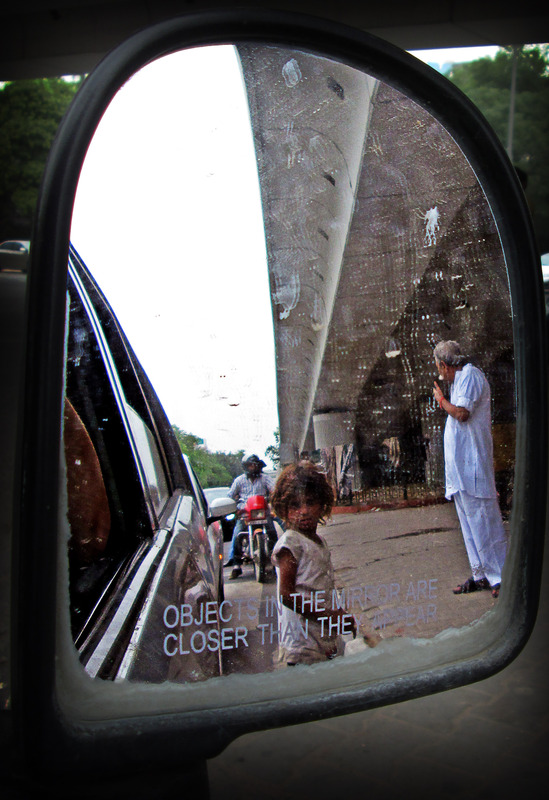 Her family live their life out under a flyover, on a busy junction and beg for a living. Who knows their story, perhaps once migrant workers now jobless, perhaps shipped in by ‘boss’ types to take advantage of begging rights and taken advantage of themselves. Genuine or not it doesn’t matter. They’re there in early the morning, making roti on a little fire, bathing or still sleeping on the concrete before they get ready for the rush hour. They’re there in the evening, finishing off after the rush hour, cooking , bathing or getting ready to sleep again on the concrete. The only time they disappear is when the police are gathered at their police hut in the middle of the junction, but to most they don’t appear to be there at all, at least they pretend they’re not there.